The Federalist Party evolved from the core of Federalists, like George Washington and Alexander Hamilton, who wrote and defended the US Constitution in 1787–1788. The political party advocated a strong central government and supported a liberal construction of the Constitution. John Adams, elected in 1796, served as the only Federalist Party president, and the party held little power after 1801.
conscientiously believe that governments founded in them are most friendly to the happiness of the people at large; and especially of a people so capable of self government as ours. I have been ever opposed to the party, so falsely called federalists, because I believe them desirous of introducing, into our government, authorities hereditary or otherwise independant [sic] of the national will. these always consume the public contributions and oppress the people with labour & poverty. Our last post brought me your friendly letter of Nov. 27. I learn with pleasure that republican principles are predominant in your state, because I conscientiously believe that governments founded in them are most friendly to the happiness of the people at large; and especially of a people so capable of self government as ours. I have been ever opposed to the party, so falsely called federalists, because I believe them desirous of introducing, into our government, authorities hereditary or otherwise independant [sic] of the national will. these always consume the public contributions and oppress the people with labour & poverty. no one was more sensible than myself, while Govr. Fenner was in the Senate, of the soundness of his political principles, & rectitude of his conduct. among those of my fellow laborers, of whom I had a distinguished opinion, he was one: and I have no doubt those among whom he lives and who have already given him so many proofs of their unequivocal confidence in him, will continue so to do. it would be impertinent in me, a stranger to them, to tell them what they all see daily. my object too at present is peace and tranquility, neither doing nor saying any thing to be quoted, or to make me the subject of newspaper disquisitions. I read one or two newspapers a week, but with reluctance give even that time from Tacitus & Horace, & so much other more agreeable reading. indeed I give more time to exercise of the body than of the mind, believing it wholesome to both. I enjoy, in recollection, my antient [sic] friendships, & suffer no new circumstances to mix alloy with them. I do not take the trouble of forming opinions on what is passing among them; because I have such entire confidence in their integrity & wisdom, as to be satisfied all is going right, & that every one is doing his best in the station confided to him. under these impressions accept sincere assurances of my continued esteem & respect for yourself personally, & my best wishes for your health & happiness. To what extent were the concerns of Jefferson mirrored in the contemporary debate over federal and state powers? 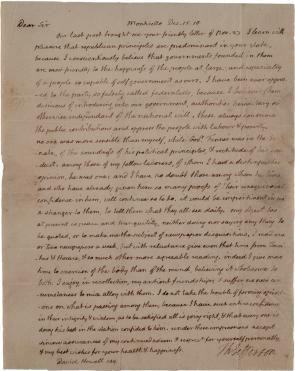 How did Jefferson, in 1810 out of office only a year, explain his reluctance to engage in political debate or even to keep up with current events in the newspapers? Why did Jefferson use terms such as “pleasure” and “happiness” to describe a republican style of government?